The government of Mauritania should fully implement a recently adopted anti-slavery law to demonstrate it is serious about ending slavery, says Minority Rights Group International (MRG) in a new report. 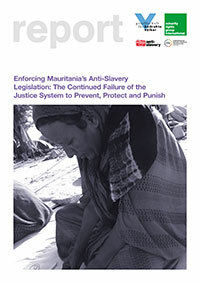 The report, Enforcing Mauritania’s Anti-Slavery Legislation: The continued failure of the justice system to prevent, protect and punish, investigates why an earlier 2007 law was unsuccessful in eradicating slavery. The 2007 anti-slavery law remains largely unenforced, as all those involved in the criminal justice system, including the police and judiciary, are not adequately addressing instances of slavery brought to their attention, says the report. ‘Since the creation of the law, there has been only one conviction of a slave owner, despite the continued widespread practice of slavery in Mauritania. Even then, the sentence handed down was less than the minimum set down in the law, and the convicted slave master was promptly released on bail pending his appeal,’ says Carla Clarke, MRG’s Senior Legal Officer. ‘It takes great courage for those held in slavery to come forward, but when they do they are constantly let down by the criminal justice system, with police not investigating their claims or pressure from prosecutors for them to drop those claims. If the 2015 law is to stand any better chance of success, the failings in the implementation of the previous law need both to be acknowledged and addressed,’ Clarke adds. Mauritania was the last country to abolish slavery in 1981, but the practice persists today, predominantly perpetrated by the Moor ethnic group and affecting mainly the Haratine ethnic group. Those Haratine who remain in slavery are treated as the property of their masters, living under their direct control and receiving no payment for their work. The new law, on paper at least, strengthens earlier 2007 legislation, with higher sentences and opportunities for human rights organisations to represent victims. The report, drawing on a number of case studies, faults the criminal justice process at all stages: from lack of initial police follow up, inadequate investigation by prosecutors, to judges not enforcing proper procedure or sentencing in compliance with the law. ‘The common thread from all examined cases is not only a widespread lack of will to punish the crime of slavery, but also the collusion of various authorities to prevent enforcement of the anti-slavery law,’ says Sarah Mathewson, Africa Programme Co-ordinator at Anti-Slavery International , who co-authored the report. Despite ratifying international and regional human rights conventions supporting abolition of slavery, there is still widespread practice and acceptance of slavery in Mauritania, a reality which continues to obstruct victims from accessing justice.